Natural bee honey has been suggested as an alternative treatment for hay fever and other allergies. Not all honey is the same, however, since bees make honey by gathering nectar from the flowers common in their vicinity. 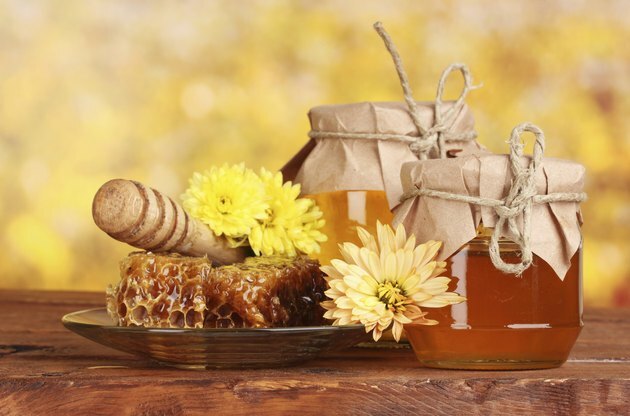 The composition and medicinal properties of honey vary depending upon the mix of flowers the bees visit. Manuka honey is a plant-specific honey purported to have healing properties. Talk with your physician before you try Manuka honey to treat or prevent your allergy symptoms. Manuka honey is made by bees who collect nectar exclusively from New Zealand's native Leptospermum scoparium plant. A University of Waikato article reports that Manuka honey contains a unique, antibacterial ingredient not found in other honeys that makes it an effective antibiotic and wound healer. According to Memorial Sloan-Kettering Cancer Center, Manuka Honey has been used as food, to promote wound healing and to relieve gastrointestinal problems. Other names for Manuka honey include tea tree honey, Australian tea tree honey, active Manuka honey and antibacterial honey. Manuka honey is a natural product, but it contains substances from bees and the flowers they visit that are foreign to your body and may cause an immune system or allergic reaction. Normally, your immune system protects you by identifying foreign substances or organisms then acting to destroy, sequester or inactivate them. Sometimes, however, your immune system overdoes it by overestimating the threat and overreacting. The immune system responds to an allergen by releasing histamine, whose side effects include itching, swelling, hives, rashes and runny nose -- allergy symptoms. Honey allergies may be triggered by proteins from bees or from plants, according to a 1998 report published by Australia's Therapeutic Goods Administration, although the authors of this study concluded that honey allergies are rare. A 2010 study published in the "British Journal of Nutrition" looked at the safety of Manuka honey in healthy subjects. The study measured the immune system responses of subjects who were given 20 grams of Manuka honey per day for two weeks and two more weeks of honey made from multiple plant sources. The researchers found no evidence of a immune system response associated with either type of honey. Some people theorize that because honey contains substances from bees and a wide variety of plants, eating honey should desensitize your immune system to the bee and plant allergens. A 2002 study published in the "Annals of Allergy, Asthma & Immunology," however, found that honey was no more effective at relieving rhino-conjunctivitis symptoms than a corn syrup placebo. British Journal of Nutrition; Demonstrating the Safety of Manuka Honey UMFw 201 in a Human Clinical Trial with Healthy Individuals; Alison Wallace, et al. The University of Waikato: What's Special About Active Manuka Honey? Annals of Allergy, Asthma &amp; Immunology"; Effect of Ingestion of Honey on Symptoms of Rhinoconjunctivitis; TV Rajan, et al.